China poses “the broadest, most challenging, most significant threat we face as a country,” FBI Director Christopher Wray said after a week of drama in Washington about the U.S.-Russia summit in Helsinki. FBI Director Christopher Wray speaks at the Aspen Security Forum. The U.S. is investigating economic espionage linked to China in every U.S. state, Wray said on July 18 at the Aspen Security Forum. China is engaged in a long-term espionage effort and its success is driven by a “whole of state effort,” Wray said. 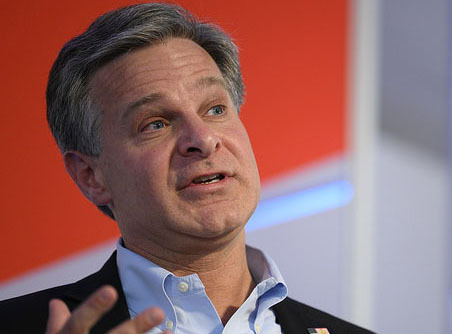 “It is economic espionage as well as traditional espionage; it is nontraditional collectors as well as traditional intelligence operatives; it’s human sources as well as cyber means,” Wray said. Economic espionage carried out by Beijing’s operatives “covers everything from corn seeds in Iowa to wind turbines in Massachusetts and everything in between. So the volume of it, the pervasiveness of it, the significance of it, is something I think this country cannot underestimate,” the FBI director said. A 2017 report by the U.S. trade representative accused China of “trade secret theft, rampant online piracy and counterfeiting, and high levels of physical pirated and counterfeit exports.” The report found intellectual-property theft by China was costing the U.S. up to $600 billion annually. China is attempting to position itself as “the sole dominant superpower, the sole dominant economic power,” Wray said.